Franklin Mineral Museum is another entertaining place. 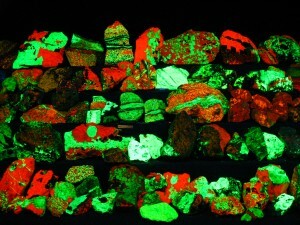 We got to go to the quarry, pick rocks and bring them in large buckets to the UV light shack. Then we put them under a UV light and see them glow. The kids loved seeing all the different colors that would show up. Of course we wound up coming home with a giant bag of rocks. I think there is an amount of rocks that’s included in the admission price, anything over that you would have to pay for. The nice lady inside weighs them for you and lets you know. Now they are in the place of honor in the basement, except we don’t own a UV light, and thus can’t look at the beautiful colors. We also got to see so many specimen inside the museum, and a recreation of the mine. Also, for an addition price you can try prospecting. Which we didn’t, because the kids were pretty tired at that point. The boys seemed to have a rather good time with all of it. Their gift shop has a lovely selection of rock related items, and some assorted toys and games. Their schedule changes through out the year and I think they are open from March to November, and close for the winter months, so make sure to check the website for information: FRANKLIN MINERAL MUSEUM WEBSITE.